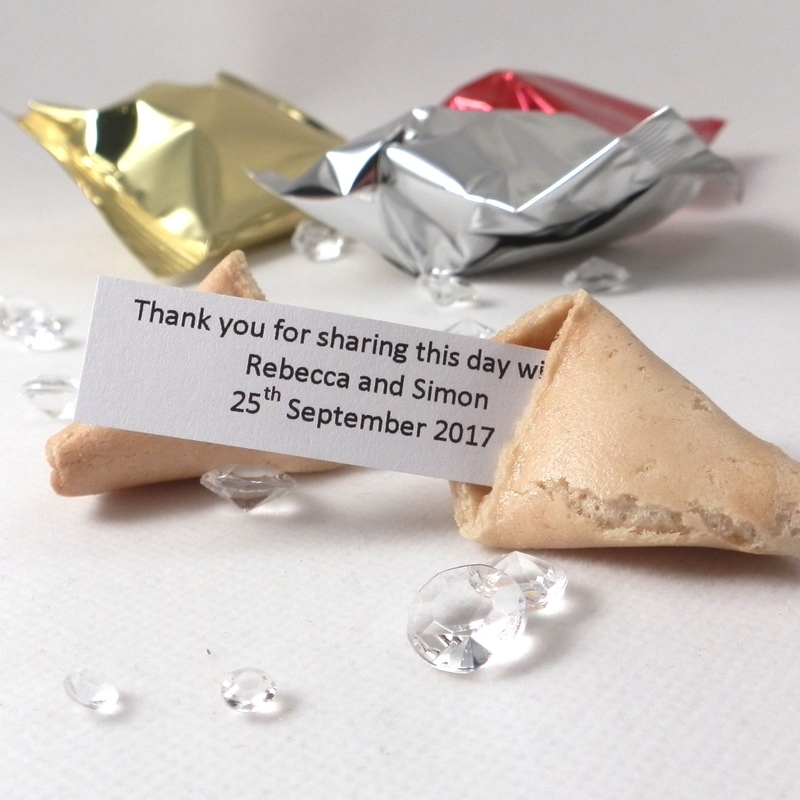 These Wedding Fortune Cookies contain a traditional fortune and can be personalised with your names and wedding date to create unique wedding favours. Our Traditional Wedding Fortune Cookies are stylish wedding table decorations and unique wedding favours all in one! Definitely a talking point at your wedding tables! 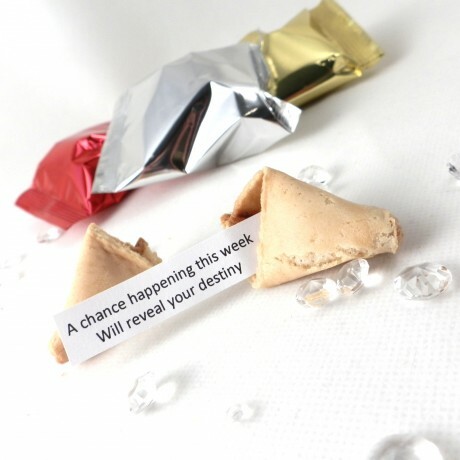 Place a wedding fortune cookie at each place setting and in bowls around your wedding venue. 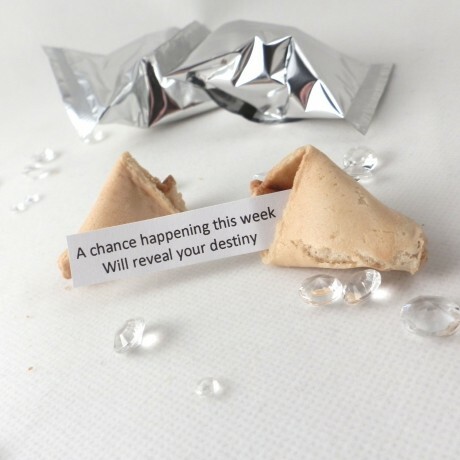 The 'Traditional Fortune' wedding fortune cookies are available in packs of 50, 100, 150 and 300 and in a choice of wrapper colours - red, silver or gold - and contain a traditional fortune. We can also personalise your Wedding Fortune Cookies by printing 'Thank you for sharing this day with us' followed by your names and wedding date on the reverse of the message slip. Please ensure that you enter your names and date correctly as we will print using these details - there is no option to change these once you have placed the order. 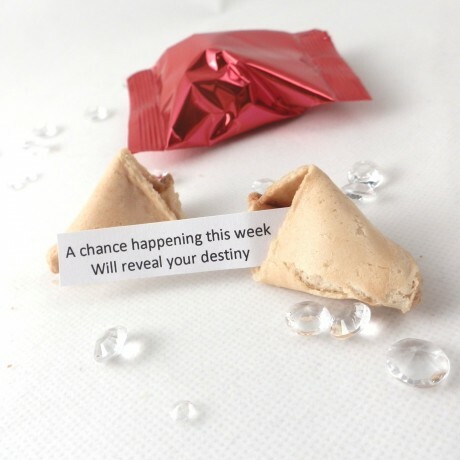 The delivery time for non-personalised Wedding Fortune Cookies is 1-3 days. Please allow 5-7 working days from the date you place the order for personalised Wedding Fortune Cookies. The personalised fortune cookies are made to order and have a shelf life of 8 months. 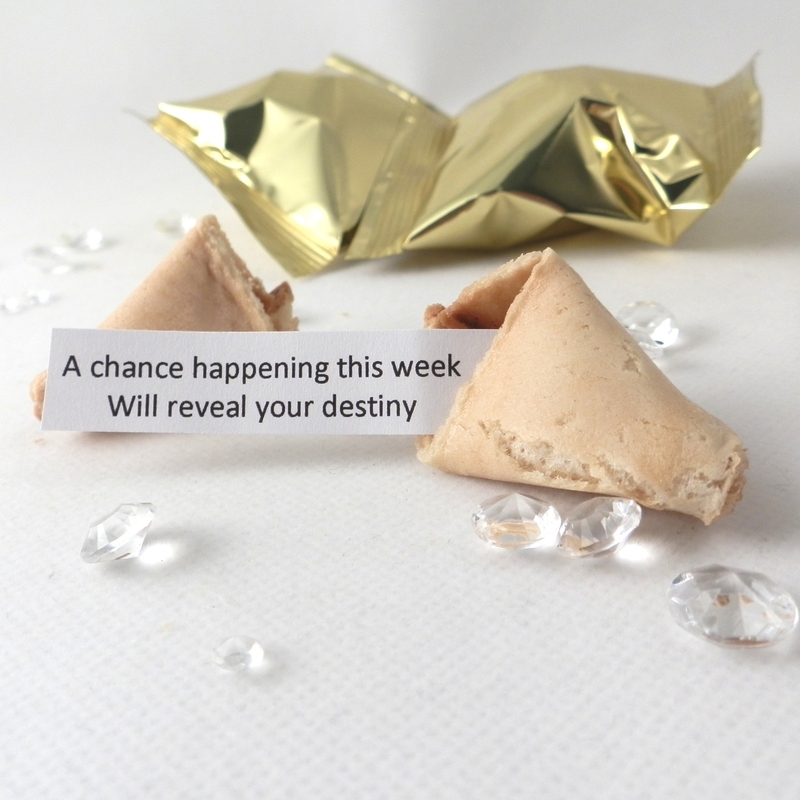 For non personalised wedding fortune cookies if you message us with your wedding date when you place your order we will ensure that the fortune cookies which we send you are well within their shelf life at the date of your wedding. Returns: Please note as these are foodstuffs we are unable to accept returns unless there is a fault in the product. We do offer a sample pack which can be purchased if you wish to see samples prior to placing an order for a larger quantity.